Candles Restaurant is a British/Continental Licensed Restaurant which has been family run for the last 12 years. 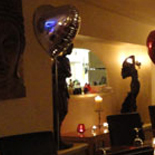 Candles is one of Llandudno's most successful restaurants with a warm and frendly atmosphere with soft lighting and candlelit tabeles, soft music in the background and excellent food. The dress code is casual/smart and well-behaved children are more than welcome. The owner Mr C.J. Hughes is also the chef who has been in catering for more than 25 years. So with kind of experience we can cater for all your catering needs. We have three/four course set menu and the only restaurant in Llandudno which has four course vegetarian set menu. As well we have a full a la carte menu. All our food is from the best local suppliers. Food is cooked to order so that you get it at its freshest and best quality. Candles Restaurant is very easy to find, it is situated in the centre of Llandudno just 200 yards away from the Town Hall. 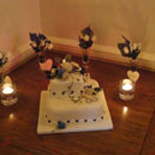 Candles Restaurant is available for any special occasions such as small weddings & parties for approximately 40 guests. 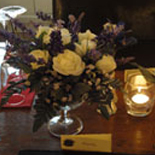 We look forward to seeing you at Candles and to avoid disappointments we strongly recommend that its best to book in advance for the weekends.